Mann has a new paper: he apparently discovers the Medieval Warm Period | Watts Up With That? IPCC 2001 Comparison of warm-season (Jones et al., 1998) and annual mean (Mann et al., 1998, 1999) multi-proxy-based and warm season tree-ring-based (Briffa, 2000) millennial Northern Hemisphere temperature reconstructions. Intervals of regional warmth and cold in the past are linked to the El Niño phenomenon and the so-called “North Atlantic Oscillation” in the Northern hemisphere’s jet stream, according to a team of climate scientists. These linkages may be important in assessing the regional effects of future climate change. “Studying the past can potentially inform our understanding of what the future may hold,” said Michael Mann, Professor of meteorology, Penn State. Mann stresses that an understanding of how past natural changes have influenced phenomena such as El Niño, can perhaps help to resolve current disparities between state-of the-art climate models regarding how human-caused climate change may impact this key climate pattern. Mann and his team used a network of diverse climate proxies such as tree ring samples, ice cores, coral and sediments to reconstruct spatial patterns of ocean and land surface temperature over the past 1500 years. They found that the patterns of temperature change show dynamic connections to natural phenomena such as El Niño. They report their findings in today’s issue (Nov. 27) of Science. The researchers found that 1,000 years ago, regions such as southern Greenland may have been as warm as today. However, a very large area covering much of the tropical Pacific was unusually cold at the same time, suggesting the cold La Niña phase of the El Niño phenomenon. This regional cooling offset relative warmth in other locations, helping to explain previous observations that the globe and Northern hemisphere on average were not as warm as they are today. Comparisons between the reconstructed temperature patterns and the results of theoretical climate model simulations suggest an important role for natural drivers of climate such as volcanoes and changes in solar output in explaining the past changes. The warmer conditions of the medieval era were tied to higher solar output and few volcanic eruptions, while the cooler conditions of the Little Ice Age resulted from lower solar output and frequent explosive volcanic eruptions. These drivers had an even more important, though subtle, influence on regional temperature patterns through their impact on climate phenomena such as El Niño and the North Atlantic Oscillation. The modest increase in solar output during medieval times appears to have favored the tendency for the positive phase of the NAO associated with a more northerly jet stream over the North Atlantic. This brought greater warmth in winter to the North Atlantic and Eurasia. A tendency toward the opposite negative NAO phase helps to explain the enhanced winter cooling over a large part of Eurasia during the later Little Ice Age period. The researchers also found that the model simulations failed to reproduce the medieval La Nina pattern seen in the temperature reconstructions. Other climate models focused more specifically on the mechanisms of El Niño do however reproduce that pattern. Those models favor the “Thermostat” mechanism, where the tropical Pacific counter-intuitively tends to the cold La Niña phase during periods of increased heating, such as provided by the increase in solar output and quiescent volcanism of the medieval era. The researchers note that, if the thermostat response holds for the future human-caused climate change, it could have profound impacts on particular regions. It would, for example, make the projected tendency for increased drought in the Southwestern U.S. worse. Other researchers on the project were Zhihua Zhang, former postdoctoral fellow in meteorology now at the National Oceanic and Atmospheric Administration; Scott Rutherford, Roger Williams University; Raymond S. Bradley, University of Massachusetts; Malcolm K. Hughes and Fenbiao Ni, University of Arizona; Drew Shindell and Greg Faluvegi, NASA Goddard Institute for Space Studies, and Caspar Ammann, National Center for Atmospheric Research. The National Science Foundation, the U.S. Department of Energy, NOAA, and NASA supported this work. November 26, 2009 in Climate data, Paleoclimatology, Science. ← IPCC reviewer: "don't cover up the divergence"
My understanding was that the Pacific was warm at the same time as northern Europe. That’s why the Polynesians were able to settle as far apart as Hawaii, New Zealand and Easter Island during this period. Then the cold spell set in and the travel was too difficult. So Mann is telling us that the Polynesians settled the Pacific during the cold period (bringing warm weather vegetables such as Kumara) and then lost contact during the warm period? It doesn’t seem to fit at all well. It appears there might be a real hockey stick, after all. I have just noticed on YouTube that the video featuring Mann in “Hide the decline” http://www.youtube.com/watch?v=nEiLgbBGKVk has been removed from the “Most Viewed List”. It was in the top 10 earlier today and with 163000 views should now be at the top. I wonder how Mike’s work was reviewed? The paper is generally well written. I recommend acceptance subject to minor revisions. I will leave it to the editor to check that most of my comments have been responded to. My recommendation is that the paper be accepted subject to minor revisions. It is certain that this paper will get read by a particular type of climatologist, so it ought to be as clear as possible. I’m happy if all the thoughts are ignored. “I’m happy if all the thoughts are ignored.”!!! This paper is to be thoroughly welcomed and is particularly timely with the next IPCC assessment coming along in 2007. The availability of the data and the programs on a website will go a long way to silencing the critics. I suspect though that this will not be the last word on the subject. This manuscript is expertly written, which isn’t a surprise given the number of authors and the internal reviewing now applied by many of the institutions involved. My comments are mainly minor ones of clarification. My recommendation is that it should be accepted subject to minor revision. I can’t see either of these papers being in the next IPCC report. Kevin and I will keep them out somehow – even if we have to redefine what the peer review literature is! They have certainly re-defined peer review in the echo chamber of climate science!!! Let’s see how AGW is affecting rainfall and drought Down Under. Well, I, uh, ahem. Move along, nothing to see there. If the tropical Pacific cools when the northern climes warm…that means the Earth’s energy budget system NORMALIZES itself. It means there is NO THREAT of runaway warming…it means warm forcing has NEGATIVE FEEDBACK…and it means the AGW crowd has been crowing about NOTHING for years. From what I have learned here about Dr. Mann over the past week or so, it appears that his research program has always been to create computer models that would demonstrate an a priori truth, “anthropogenic forcing of the climate.” The anthropogenic forcing is a given, not something to be demonstrated or disproved. You start with a postulate, use the postulate to filter data, and then claim that the data proves the postulate. In the humanities fields in which I was trained, we called this “circular reasoning.” This program has made Dr. Mann a very influential and powerful academic figure over a very short time period, and I suspect that nothing short of a successful criminal prosecution or lawsuit will slow him down. The warmer conditions of the medieval era were tied to higher solar output and few volcanic eruptions, while the cooler conditions of the Little Ice Age resulted from lower solar output and frequent explosive volcanic eruptions. How often does Michael Mann acknowledge any role of sol in these paleo reconstructions? Is this progress? … What’s this? Mann using the Goldilocks method for picking climate theories…. This one is too hot. That one is toooo cold. And this one is Juuust riiiiight…. Now just sit back and watch the funding just roll in. Climate gravy outta a gooey porridge of data! The researchers didn’t discover anything at all that has not always been known by historians or by anybody taking a walk in uphill parts of Europe and wondering why all those farms have been abandoned ( because it used to be warmer and farming there us to be feasable when now it is not ). First of all, why is everything an anomaly??? Secondly, is this simply a case of, “if we don’t call it warm, people won’t put two and two together”? Thirdly, who are “we”. Is this the Royal “we”, or the group associated with the leaked Hadley emails? Come *on*, Professor, stop moving the goalposts and be straight with people. It appears peer review looked far more like the “star chamber” (of popular movie fame) – a cabal. I wonder how long Mann was sitting on thie friggin’ report before he produced it? It cannot be a coincidence that this is coming out now. Mann is trying to rise above the rest of the AGW crowd and save his own skin. I hate this…what tricks will they employ next? This sounds a lot like: “They want a Medieval Warm Period? Let’s give ’em one! But our way!”. It will be a Medieval Warm Period not as warm (globally) as it is today. It will look like an ordinary bump in the temps. Their word «offset» wrt the temps due to their southern hemisphere ‘cooling’ will do the job. This is my bet! Though the Modern Warm Period appears modestly warmer globally in comparison with the previous centuries of the Little Ice Age…. Is not La Niña a relatively short term phenomenon? Is not the “Medieval Warm Period” (excuse me, it is the ‘Medieval Climate Anomaly’) a long term event? Maybe La Niña events lasted for 10s or 100s of years back then. Will they explain this in the published paper? In other words, just like it is now. The problem then for Mann is, as Dr Svaalgard says, if the sun was a major player then, it’s a major player now, so they can’t say the sun isn’t having as much influence in modern times. Medieval Warm Period: The error bars are larger – three to four times larger than during the Little Ice Age. It’s easy (and correct!) to conclude that the general temperatures were hotter than during the LIA; almost as hot as now, if not hotter than now. But Mann creates the IPCC’s hockey stick by excluding the error bars (in published graphs) and drawing HIS line through middle (and bottom) of the MWP error bar “group”. Now, the real question. How “many” error bars (lines of data from different studies) are at what point in what year? Mann presents a long vertical “bar” – but how many data lines are “high” in that single anoymous bar? How many of Mann’s studies show that the temperatures were “high” during the MWP, against those (one, two ?) that he chose showing that they were “low”? We know he drew his hockey stick through the :low” studies – but what exactly were the points in those studies? Did he “lie” in creating the hockey stick? Or was Mann just very “tricky” – as he phrases it in today’s email releases – in choosing what to publish for his “peer review” papers? Apparently Mann wanted this “small %” of protected NMS data, and got it from CRU. If that be the case, Mann would know how to and did obtain permission from all the nasty Icelanders and Russians and such. Also, Mann and his team used a network of close-knit “peers” (friends) such as Keith Briffa, Phil Jones, Caspar Ammann, et al…to fiddle, fudge, cherry-pick, and conspire as they please, data that only supports their pre-supposed (and circularly-arrived at) theory that humans are inducing climate change. I’m so confused. First they tell us we’re going to be incinerated in some thermocalypse (I’m obviously excluding those poor Nebraskans who will get to smell the hot ocean spray moments before they drown). Now they’re saying that the earth has been warmer and then cooler in the past but some warm parts were actually cooler and some cool areas were warmer. I wish I was a McDLT. Keep the hot side hot and the cold side cold. Mann’s work is not relevant to any serious discussion of anything. He is too compromised by transparently bad work. Now he mumbles something about the MWP…that wasn’t really an MWP. Repudiate the hockey stick, accept that the past predictions of future climate catastrophe wree bunk, and apologize to those he has so rudely and unprofessoinally denigrated, and then maybe he will have some credibility. Otherwise, this is just another trash study by a proven fraud. Drought is nothing new to the U.S.
May one assume that Mann’s paper is both robust and peer reviewed? [ /snark off] I find myself sorry for resorting to snark like this, but peer review is supposed to be a genuine aid to the search for scientific knowledge and the revelations of the past few days tend to leave a bitter taste regarding the process. Let me guess – featuring a warped and twisted hockey stick, proving once again that we are experiencing unprecedented warmth. Additionally, we’ve changed Greenland to Whiteland. I had a thought looking at the CO2 graph in the widget. CO2 seems to be virtually a straight line since 1978 according to the graph. Is this actually true? Have there been no volcanic eruptions to provide a spike in the record? Has the use of carbon based fuels been continuous and even over the 30 year period? Even in the current recession has fuel consumption continued a steady increase? Perhaps the CO2 data may be fudged also. Cute way of not saying “could” so many times. This could easily be translated by some popsci writer as “would increase drought in the SW”. Mighta-coulda-woulda-shoulda science. I hope Mike gets plenty of gifts for Xmas, tea leaves, goat entrails, bones to toss. We need to be threatened over and over again with increasing projected tendencies. Not another “PlayStation-state-of the-clumsy-art climate models”, please! When the bulldozing of climate dept requires the bulldozing of the History dept, eventually you will get push back I hope. One of the better articles I’ve seen so far (National Post in Canada). You’re not the only one to question this. Does anyone have alternate sites of Co2 samples? Pompous Git, please go back to Climatechangedebate. We miss all the fun we had when you were tearing apart those warmaholic trolls. Seriously! Why has no blogger mentioned the elephant in the room? Jones and Hansen control all the temperature data, and they simply are not showing it. Why doesn’t this jump out at everyone? You’re looking at temperature. The upward line is CO2. I’m seeing these “independent” re-creations of past temperatures as a continued “lamination” of the blade. I hate that term. There was nothing anomalous about it. The climate was what it was. To Mann et.al. (look at the co-author list!) its just another unexplained divergence from canonical tree ring data. If a 400 years climate phenomenon is called an anomaly, how do you call this little 30 years warmish cycle we just went through? C’mon! Now my high priest is telling me the science isn’t settled. What is a poor acolyte to do? Is there an actual list anywhere of the countries that won’t release the data for free? That seems to be another wild claim, esp with the context of some of the email. Well, that graph looks a bit different, doesn’t it…and it looks a LOT different if we exclude the garbage data at the right. I do not want to harp on this but in an earlier posting I pointed out that “Hide the decline” has been removed from all of YouTube’s most viewed videos. As well as most popular videos. Now we have been complaining about the mass media not covering this story. This has been a great advert for ClimateGate. This video was fast becoming one of the most viewed vids on YouTube and it has now been “hidden”. Check for yourself – http://www.youtube.com/videos?s=mp. Has YouTube now also joined the mass media in hiding the decline ? current warming too – pure rubbish. (GHG, solar) over the past millennium. This is such a proof they do not have a clue on how the climate works! Still ignoring the solar activity – cosmic ray – low level cloud – increase albedo hypothesis, interesting but not surprising. By limiting solar effects to solar activity – irradience, that means less watts/m^2 are needed to give the 100+ year trends. This allows the computer models or AGCMs (when properly tuned for big temp changes for small watts/m^2 changes) to be more sensitive to the calculated watts/m^2 of CO@ and other GHGs. oops, CO2 not CO@ and really not relly. Can anyone really believe these jokers anymore? GIGO and they keep on redefining the dump. I have no faith in trees proxies at all. To me its all junk science. Could you imagine the weight that would be given to paleodendroclimatology if not for this AGW supporting magic numbers methodology? Google owns youtube now. Google is probably the most “progressive” organization on the planet since the Soviet Union collapsed. Their data is as reliable as Jones’ or Mann’s, but they don’t have to worry about “Peer Review”. Same old team. Is there no scientist who can do work without having to be part of a big team? Is this the only way each scientist can keep up his number count of “peer-reviewed” papers? Isn’t this simply another variation of the “warmist” theme that the MWP was a regional anomaly rather than a global phenomenon? Maybe I misunderstood what I was reading, but my dim comprehension of the New Zealand cave studies and the Woods Hole ocean sediment findings indicated that the warming was global. I am reading W J Burroughs ‘Weather Cycles Real or Imaginary?’ and opposite page 20 is wonderful gently descending oscillating graph produced by smoothing random numbers using a low pass filter. What ! A respectable graph produced by random numbers !! This Slutsky-Yule (yes it is getting near) effect was named after two statisticians who demonstrated in 1927 that 19th century trade cycles could be reproduced from a series of random numbers. I found that amazing, just what degree of confidence does it take to produce a climate correlation graph that differs from that produced by a random number generator? Will Mann’s effort pass the test ? OT but highly unlikely ETS will pass Australian Senate now. If the Liberal skeptics stick to their guns they should easily win the next election in 2 years (unless of course most labour members become skeptics by then and it becomes a non-issue!). As climategate continues and temperatures do not rise support will surely erode to 0 eventually. So Mann has got a new paper that reconstructs the Medieval Warm Period and changes it’s name? Maybe instead of working on spurious paleoclimatology to refashion a “Medieval Climate Anomaly” he could spend some time addressing the “Modern Ethics Anomaly”. Not to mention elephant seals breeding on the Antarctic continent during the MWP where it’s now too cold. The Team usually say that the MWP was confined to Europe & North America. I guess that means Antarctica, New Zealand and all those other places drifted away from each other over the last millennium. Or that my geography’s wrong as well as my history. Sorry for the OT here. Luckily, you guys ban trolls. China promises reductions based on CO2 emissions/GDP. Afterall, if western history is any indication, CO2 emissions based on GDP have declined as prosperity increased. Its a no-brainer for China. The west should agree and initiate measures when China reaches our already low ratios. But Obama and others will jump on China’s meaningless promise, and insread impose absolute reductions. Konrad, anomaly is an astronomical term they got from Jim Hansen. It’s the angle between the radius vector of an orbiting body and the major axis of the orbit measured from the perihelion in the direction of motion. I think Mann got as far as “astronomical” in the sense of “big”. No, Mann is setting up the next round of the shell game. He says the MWP was not particularly warm, and certainly not global – same propaganda as before. Same goal-oriented research. Good example of this in the Comments above. Mann has identified the oscillations as a powerful tool for critics of his favoured theory, and is setting about ‘disarming’ them. And his conclusion? Global Warming is even scarier than we thought. At least he’s consistent. I hope the article get reposted in full on WUWT. You have to wonder if Mr. Mann had that paper sitting the refrigerator, waiting for the day when the the emperor was discovered to have no clothes. He will now allow the MWP to be rehabilitated – but only on his terms (even a brand new name to boot). Now discovered: the Mann Consistency Anomaly. Well, Science has a policy that authors must honor all reasonable requests for data and methods. I wonder how many readers here would care to write a letter to Science requesting the data and methods? I imagine that the editors mail boxes could be filled up with requests from readers here. I just had some free nights and decided to watch “Connections,” the series James Burke made in the late 90s. It is remarkable to see the weight he puts on climate in that series. Not an episode goes by without mention of the MWP and the LIA. In James Burke’s view it is the prinipal driving force behind so much of what happened in recorded history from the Middle Ages on. I would go so far as to say that those two climatic periods co-star through the entire series. Maybe Mickey Mann had some free time on his hands too. Seems to me, that this backs up Linzdens Hypothesis of a self regulating Earth Iris. Reminder: Skeptic Tim Ball is on Coast to Coast AM in 30 minutes. Mann never said there wasn’t a Medieval warm period. Also, if you question the reliability of paleoclimate data, or say that it’s been “inverted,” what’s YOUR basis for estimating the magnitude of the medieval warm period? I am sure you have all noticed the Mann gap by now… that is the variation between reality and fairy science. Mann is not worth the time of day. All of this group do need ethics reprogramming… but does anyone think they can be trusted to do anything honestly? At this point we have polluted the scientific data and a significant number of former ‘scientists’ … we need to start over… or drop the entire BS. This Mann guy, can he explain to me how grapes grew at Hadrian’s wall if it was so “mild”? Always good to have a recent peer-reviewed paper in your resume when you’re looking for a new job. Am I missing something or is he calling the MWP “regional”? From my reading of papers published in just the past year, it seems climate was doing much the same thing in both the Western and Eastern halves of the Northern Hemisphere. Both Alaska and Europe show changes due to warming during that period. First dawn. Now, sunset of Mann. Your services are no longer needed, sir. Thank you for playing the game. We now return you to your regularly scheduled program. I’m sorry, didn’t somebody tell us that the science was “settled”? (Me, I’m still wondering about the CG email where McCracken is saying that sulphates may be the cause of current lack of warming but they have no idea just how much China is emitting – “so to poor emissions data in mid 20th century we’ll add poor data this century” [quoting from memory so probably not exact wording, but that was the gist]. So how can the model outputs be remotely fit for purpose if one of the (accepted) major inputs is highly inferred speculation? It’s an interesting observation that none of the team actually ever go out and collect data. Too far from Starbucks? They either take pre-existing data sets from the literature, buy data sets and then torture them so that apples become pears, and pears become apples. What I’d like to see is the use of a model to make a retrodiction about the past and then to test it by looking at the proxy data. Unfortunately the proxies are not of sufficient accuracy and precision to carry out such tests. Happy Thanksgiving and Thanks for your efforts at WUWT. Wonder what Phil Jones is having for Thanksgiving? Oh, I forgot, he’s the turkey. As for the question if the MWP is local or worldwide, the following recent paper may be an answer: D. W. Oppo et al., “2,000-year-long temperature and hydrology reconstructions from the Indo-Pacific warm pool,” Nature, Vol 460 (27 August 2009) 1113-1116. I think this paper was already introduced somewhere, but its results are too important to forget, so I want to mention it once again here. Most importantly, their method can directly compare paleoclimate and present climate because they used a sophisticated core sampling technique, which does not disturb the surface layer of the sea floor. Thus they succeeded to estimate sea surface temperature (SST) for the period 300 BC – 2000 AD based on the Mg/Ca ratio method, which is a much more reliable thermometer than the tree-ring method. Figure 2 of the paper clearly shows the MWP as well as the LIA. The result is very impressive and convincing. Thus, the claim that the ENSO cancelled the MWP in the tropical regions is incorrect. The MWP and the LIA should have been worldwide, anyway. The same figure tells us that the SST for the MWP compares well with or is even higher than the present values. According to the authors, the region they tested can represent the mean global temperature. This may mean that the MWP in other regions also did not have lower temperature than the present. Interestingly, the shape of the curve for the SST change is very similar to that for the precipitation in China: P. Zhang　et al., “A Test of Climate, Sun, and Culture Relationships from an 1810-Year Chinese Cave Record,” Science, 7 NOVEMBER 2008 VOL 322, 940-942. 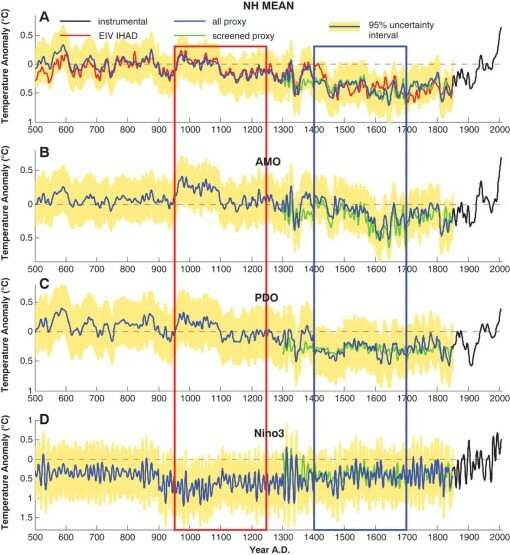 This paper shows that the precipitation change nicely follows the solar activity change throughout the period they examined (200 AD – 2000 AD, see their supporting material). Then, naturally, the SST for the Into-Pacific also follows the solar activity changes, and hence …. Quite interesting, isn’t it? Debate!! Yes, on the BBC! Has Mann archived his method in full and his data and his metadata in full? Have the reviewers insisted that he does so? Have the reviewers checked that his method and data yield the results he claims? If so then his paper might be worth reading. But I also agree with previous posters on the unjustifiable un-naming of the Medieval Warm Period (so they did grow grapes in Yorkshire after all…) and the alleged cooling of the patently warm Pacific (The Incas farmed higher terraces than we can today…). Did the peer reviewers pick up these flaws? Did the journal editor submit the proof to an archaeologist? If not, why not? I don’t know if the creators would have or have had it removed or not… but it can be found at their website. Just google Minnesotans For Global Warming. Might even be minnesotansforglobalwarming.com but I’m not certain. Shame its not still on youtube where its easy for so many to find, but hopefully folk’ll start posting the link to the original website and it will still be seen quite a bit. That christmas tree is fun-ky! Ramstorf acknowledges the sun as a factor here, yet he dismisses it as a factor in today’s warming in order to pin all the blame on CO2. Is 30 years, 100 years enough to be large-scale? Surely Ramstorf cannot dismiss that warming has actually been occurring since the LIA. They make themselves look like charlatans by selecting time frames that are convenient for their hypothesis, among other shenanigans. From a forensic point a view, Ramstorf’s e-mail could not possibly be a fabricated one. His starting the letter without capitalising the first word, which is standard in German lcorrespondence, is a dead give away. I point this out, just in case there are still doubts about authenticity. For the past few weeks I have, before the CRUgate revelations, I have been wondering what these scientists thought they were doing. For sure if they keep up the pretence they might get away with it for another 10 -20 years but if they are wrong, and there is every reason to believe they are, there will be an almighty blowback for science from the politicians. They will discredit science for a generation. I assumed they were involved in a sort of folie a pleusier, which is a phsycotic disorder where many people have the same delusional beliefs which themselves are reinforced for each individual be the fact that all the others share the belief. Mann et al must know they’ve manipulated data and public opinion, in their own hearts they must know that what they’re saying need not necessarily be true, yet they persist, primarily because there’s no way back. What seemed a good idea in 1998 was perpetrated without the knowledge that it would snowball into an international debate and there would be lots of people with enough scientific knowledge demanding higher standards of proof before believing them. I believe it is beginning to dawn on Dr. Mann that eventually this enterprise will come crashing to the ground and when it does he, and his acolytes and co-conspirators will have a place in history as the perpetrators of a huge scientific hoax. His recent utterances (“No scientist would ever splice instrumental data onto proxy datar.” ” I have never deleted any e-mails” “I have never said there was no MWp”) have all the characteristics of a man trying to pull himself back from the abyss of historical infamy. In other news, a new hatchet job on “climate contrarians” has appeared in The Telegraph. It has all the look and feel of a press release. Amazing! These claims by Mann are puzzling to an Australian like me. He says the MWP coincided with a La Nina mode. La Nina in the Pacific (cools globe, not warms it) typically alternates with El Nino (warms globe) on a time scale of only a few years – much shorter than the long MWP (800-1300 AD). It has been suggested that the El Nino/La Nina cycle (El Nino Southern Oscillation, ENSO) may be modulated by the Pacific Decadal Oscillation (PDO), with one of the PDO’s modes encouraging El Nino and global warming while the other mode encourages La Nina and global cooling. But even the PDO cycle is only about 60 years – still well short of the length of the MWP era. Saying that tropical Pacific was cold during the MWP because of La Nina is… well, yes. La Nina/El Nino last few months up to year. During the MWP, PDO/AMO has for sure overturned several times from positive to negative phase. Hint #1 for authors: during the MWP, there was a series of average to above-average sun cycles, not being interrupted by solar minimum. Hint #2 for authors: since 1940, we saw again an unprecedented series of much above average solar cycles, strongest in this interglacial period. I think I will ask Phil Jones to share his research grants with me. Claude, that was my recollection also, e.g., that there was more than enough evidence of a global WMP – including, if memory serves, loss of the Mayan culture, the Anasazi, and several other indicators from various widespread parts of the world. I’d thought the ‘regional’ vs. ‘global’ was pretty well settled? Where Mann gets it wrong is that the Sun is not more active during the MWP, its just that it has less time in grand minimum phase. There is a sutble difference and the MWP is not unlike today where we have waited 210 years for another grand minimum. So we have 2 warming periods that did not experience grand minima, not rocket science really. “Medieval Climate Anomaly” – wasn’t that the term used in the much-derided Soon and Baliunas meta-analysis? journals should consider to boycot mann’s constructions. those are an embarrassment for their reputation, stealing their members’ time and reduce the available space for real science. Keith Briffa points out that the very strong trend in the 20th century calibration period accounts for much of the success of our calibration and makes it unlikely that we would be able be able to reconstruct such an extraordinary period as the 1990s with much success (I may be mis-quoting him somewhat, but that is the general thrust of his criticism). Indeed, in the verification period, the biggest “miss” was an apparently very warm year in the late 19th century that we did not get right at all. This makes criticisms of the “antis” difficult to respond to (they have not yet risen to this level of sophistication, but they are “on the scent”). November 25, 2009 (LPAC)—Not since Henry Kissinger fled a team of LaRouche organizers, in the back of a delivery truck in New York City’s Central Park in the early 1980s, has an obese fascist moved so fast to escape an angry crowd, as Al Gore did today in Chicago. Appearing at a bookstore in the downtown Loop, Gore was confronted by a team of demonstrators from a grass roots group called “We Are Change,” as he was signing his latest fascist screed on the global warming swindle. Gore bolted from the bookstore, raced down an alley, jumped into a waiting car, and tried to speed off, with protesters chasing after him and banging on the car. Midwest LYM organizers, who were also on the scene to confront the global warming swindler, provided an eyewitness account of Fat Albert’s flight of fear. Make no mistake about it. This little encounter is typical of the kinds of things going on all over the country, as the fascists who brought you the near-destruction of the United States and an onrushing global Dark Age, are no longer walking the streets, smug in the belief that they are literally getting away with murder. The mass strike dynamic is playing out in thousands of ways, every day, and the recent revelations about the “smoking gun” emails from the East Anglia University global warming propaganda center, have made Al Gore’s life a little more miserable. Yes, and in the early Bronze Age the tops of the moors in SW England that now don’t support even trees were used to grow grain. It’s not a very anomolous anomoly, is it? The title of Mann et al (2009) is “Global Signatures and Dynamical Origins of the Little Ice Age and Medieval Climate Anomaly. mann is so annnoying and previously ignorant that his reaearch raises hackles, sites like co2 science ssuggest such a plethora of other data that it was warmer in many places during the medeival warm period, his terminology of medeival climate anomalies is mind blowing. One can only hope that he now has extended the Hockey Stick to include 2001-2008, so that everyone can see that 1997-2000 whas merely a “blip”. I’ve been wondering a bit about who the 2500 consensus scientists are. If we have names, then we can check with each to see what they actually believe. So if they have 2500 people who agree with them, where’s that list? It would also be instructive to have a list of all the skeptics as well. It would be really fun if the number were higher than 2500. We can check whether they are reporting on their own studies or parroting someone else. Parrots don’t count, or at least shouldn’t. I’m wagering that most of the consensus is based on inbred, even incestuous, research of a few. If those few just so happen to control the means of communication in their field and exclude contrary voices, the others have to default to what is published. Its not really their opinion. I’d also wager that many of them aren’t any more qualified than some prominent skeptics. If McIntyre can’t get the data to check the work, those 2500 couldn’t either, so any conclusion they make has to be on faith, not facts. Anyone who has to rig the system to get desired results is obviously unqualified to be a scientist. If their science is good it will triumph over the bad. That they fudge data, calculations and keep opposing the publication of papers with contrary views, is evidence they themselves believe their own science to be bad. If they don’t believe in it, why should we? As has been noted before in other contexts, it used to be consensus that the world was flat and at the center of the universe. They should be arguing facts, not opinion. A quick one, if Greenland was warmer but the Pacific colder, then one way of doing that is to re-orient the Earth’s rotational axis by an EM (non gravity) interaction by the Earth with an interloper. The trouble with working out palaeo climates is defining a 3-D benchmark for the Earth’s celestial orientation over time. No one on Earth could have done this, yet we have to physically account for the Egyptian records that report the sun rising in the west while it, before, the east. I err – Earth based scientists could have by observing astronomical data, but then those observations assume the Lyellian paradigm that since Creation, nothing much has changed. good point: seems to provide all (at least a bunch) data and code and method (22 Meg of compressed data and stuff as supplementary info). Even if it may contain errors or so, I think it is a progress. Bad point: hide the decline… more … (figure 1) proxies reconstruction stops in 1850 (about) then go to only instrumental record. I don’t know yet if there is a reason why explained in the paper. To be checked further. ha, and I am always impressed that error interval is the same in 1800 and around than in 500, begining of the reconstruction, and all along the reconstruction… reminds me of my first year of study, when calculating errors was the very annoying point of the experiment, just add +/- 1 to all data points. Around the 2003 time frame, Michael, Scott, Tom, Phil, Malcolm, Raymond, Keith, and another Tom, get together to redefine the WMP and LIA, and the dates these occurred. Quite evidently the intention is to make the MWP and the LIA and similar events out to be purely local phenomena. There has been some debate about the extent of these events before but if the Michael Mann says these are regional variations, then we can safely ignore them and he is exonerated for leaving them out of his earlier charts/data. Of course, if it were true, he would have had to have known this before he published his earlier works, not wait till now. Of course, there is one interesting point. If these were purely regional phenomena and had no overall or significant global effect then we won’t see them in the CO2 records, will we? That is to say, if the warming of the climate translates into warmer oceans which then release CO2 and similarly if cooling allows more CO2 to be taken up by the oceans (the CO2 change following temperature) then we will only see the CO2 signature of the MWP and the LIA if they are significant and global in impact. Hmm. And what do we find? Wow! That’s quite a stunning piece of propaganda (by an apparently unattributed writer) in the Telegraph Blog. It appears to be nothing other than a list of who you really must hate if you wish to be a true AGW believer. Its fascinating the way it starts with a bogeyman in the form of a silly photo of a windblown George W. Bush, which the writer designates as: “arguably the greatest global warming sceptic of all time” ! If that was true it would sure raise him up a few notches in my estimation. It would be interesting to know who concocted this list. It does look like a rather desperate press release to rally the faithful and I wonder will it appear in similar forms in other MSM sites? Southern Greenland was FAR WARMER 1000 years ago than it is today. Those fields the Vickings plowed are under hundreds of feet of ice. Has anyone noticed that Mann’s proposed paper is pretty much a ‘copy’ of my writings over the past year and a half save that he still thinks the air warms the oceans and not vice versa ? I can see in the additional document (access freee PDF), that they still show temperature curves using proxies before 1850 with a 95% confidence interval, and the instrumental temperature record after 1850…without any confidence interval. This is an obvious trick, as usual. Proxies should be used all the way, it is misleading to interrupt a time serie and continue with another. And where is the temperature record uncertainty? We all know temperatures are adjusted like proxies, days are missing, records cover only small areas of earth. Uncertainty should be there this is unacceptable! It would be great if someone could use the data joined with this article to draw a temperature reconstruction chart using proxies before AND after 1850. Of course, I’m a big believer in the natural variability provided by the ENSO and the North Atlantic (which can be about +/- 0.5C to 0.6C together – but is more often much less than these two extremes). Mann has actually written papers about these before. Phil Jones recently co-authored a paper using the ENSO and a new measure they created for the influence of the North Atlantic (which is just a white noise series that has no impact). So Mann’s sole purpose, like Phil Jones, is a pre-emptive strike. Get out in front of other researchers trying to go farther back in time looking at the ocean cycle influences, and come up with some “modest” cycles, that are much, much smaller than the current warming of course using some sort of “new math”. Will: “I have just noticed on YouTube that the video featuring Mann in “Hide the decline” http://www.youtube.com/watch?v=nEiLgbBGKVk has been removed from the “Most Viewed List”. It quite clear what’s going on! Google is part of the Alarmist movement and is diddling with the presentation of information to suit THEIR purposes. They’ve also been doing it with their search engine to minimize the search exposure of Climate Gate. The Vikings were successfully farming (not just grazing sheep) in Southwest Greenland during the Medieval Warm period. I challenge anyone doubting it was warmer then than now to go over there and give it a try. In reading the Paleoclimate chapter in the IPCC Fourth Assessment Report (AR4): I think it’s important for your readers to understand that Mann & Jones are at the heart of it and thus the upcoming meeting in Copenhagen. Also, in the public statements you cite from East Anglia U. and CRU note their emphasis to serving global warming public policy rather than a commitment to unbiased science. If the IPCC and others begin to question their data-goodbye to their funding. Makes sense. AGW: The Road to Erewhon*: A correlation? Harvard: Liberal Iffy Ignatieff and O’s Harvard Crimson: Red-Green Magical Mann-Holdren Fraud. A Harvard Crimson article from 2003 described what fate befell two Harvard scientists who dared to challenge Global Warming. A study by two Harvard researchers quietly published last January in a small research journal has set off a political storm that has led to debate on the senate floor and internal wrangling at the Environmental Protection Agency (EPA). The study, co-authored by two scientists at the Harvard-Smithsonian Center for Astrophysics, concluded that the 20th century has been neither the warmest century of the past millennium nor the one with the most extreme weather. Unabomber & Maurice Strong’s Manifesto: Red-Green. Erewhon: “a faraway land where machinery is forbidden”. How I read this is not that Mann has discovered the medieval warm period, but that he cannot get rid of it and instead calls it an anomaly and ignores the warmth of that period with claims that climate was not global back then. They had long-term regional weather instead! It will take a lot more baby steps like that for him to extricate himself from the biggest scientific fraud of the last 200 years! Will someone PLEASE explain the principle of teleconnection to Prof. Mann? As I understand it a ‘feedback’ would be something that alters the total heat content of the system – you’re just talking about redistributing it (by bringing colder water up from the deep ocean). The increased heat resulting from an enhanced greenhouse effect would in that event be going into the deep ocean and would manifest itself as La Niña events having less of an impact in future years. Unless you can suggest a mechanism by which this redistribution of heat actually causes an increase in top-of-atmosphere radiation, you can’t really be challenging AGW on this basis. This is a Gonzo Scheme,as opposed to a Ponzi. Scientists becoming the authors of the story,not just reporters and allying with big money,Governments and media. .This is manipulation of the masses on a giagantic scale. If it’s possible to donate to the Nippc as mentioned by professor Singer in the video above,that’s where my charity money is going this year.As things progress and it becomes apparent that the BBC had a written policy that the ‘Science is settled’ and AGW sceptics were not to be given equal airtime,this organ of the State will be severely and permanently damaged.Really a wonderful result for independent thought! Steve has a blog post on this. He says he’s speechless. I find that very hard to believe, after all that’s happened! Who has questioned the reliability of all paeleo-evidence? Besides, there are written accounts, e.g. of the Viking settlements, and also archaeological evidence of human activities that would be weather -dependant? Pass that bottle of Chateau Labrador, vintage 1050. Also, c. 1000, the Vikings were regularly sailing through the Arctic Ocean, in the process of colonizing the river valleys of Russia and Ukraine. Just a wicked, wee thought. I just googled “Google ClimateGate”, the quotes are essential, and got 223 results. Given that this forum gave birth to the name, well done daddy BullDust, does anyone have any ideas how to push this number up? Maybe this is a pointless and stupid idea anyway but it’s what the warmists have been doing for years! It may provide a bit of fun in the days leading up to Wonderful Copenhagen and who knows it may help to educate some. When I said that I was waiting for Lyndon LaRouche, I thought I was kidding. Who’s next up, David Duke? This is why I respect L Svaalgard Svalgaard. If I am correct he has no opinions about AGW ect or he may even be a complete AGW’er or not but his transparency is what is credible and I fully respect that. I wish “the team” had been like that. The truth will win in the end. That is all that matters. They found that the patterns of temperature change show dynamic connections to natural phenomena such as El Niño. It as if he is saying that climate change is caused by nature…who would have guessed it!? Is it just me, but doesn’t reporting on work by discredited scientist Michael (what’s he lying about this time?) Mann demean a serious science blog like Watts Up With That? Shame on you Anthony, you’ll get your Best Science Blog award withdrawn if you’re not careful. Hahahahaha. Ask “Harry” about that. The sun is as much of an influence as it always was, and no-one has said anything different. It’s precisely *because* solar irradiation has been declining slightly in recent decades, while the world has warmed significantly, that climate scientists know it’s not the sun causing the warming this time. I would just like to say is it really necesary to employ people to adjust and distort the temperature data in favour of global warming happening.Can we have the original data to work out ourselves if it is happening? The answer seems to be no but we are expected to accept without question the outcome of their latest model runs.The Arctic ice is growing rapidly ,the snow is coming down all over the northern hemisphere and it is cold. If the present trend of of increasing arctic ice extent continues in September 2010 then the national snow and ice data centre will have to start using the word recovery,they have made no secret of distorting their graphs and using false means to compare the present data with in order promote the man made global warming hypothesis.The latest graphs produced by the national snow and ice centre at Colorado look nothing like either the ssmi ice extents produced by Nansen arctic roos Norway or the amsr-e sea ice extent produced by iarc-jaxa ,the cryosphere today agrees with the latter two. I offered three similar data sets to Gavin over at RC three years ago, offering to deposit the algorithms used to generate them with a lawyer. I was told that such a test would take too much time, then told it had been done and was then deleted. Follow your leader over the cliff? Get thee to a psychiatric hospital? Sadly enough, this is what I believe will happen: The global warming religion has gone too far now to stop. But in a few years time it will become obvious that the climate will start cooling and then the shysters will turn coat and say, we succeeded, we managed to cut emissions enough to stop the heating, yeah, now salute us for this as well. They will never accept the fact that they were wrong all along. How is many using the data if they lost it? Did he give the journal raw data and code. Why do the journals keep publishing this garbage? How can we pressure the journals to raise or merely enforce existing standards? The warmer surface does conduct and convect downward as well as evaporate and conduct and convect upward. The continual input of energy is absorbed Solar energy driving both directions. The Solar increases do increase the atmospheric temperature, and then the atmosphere radiates more to get back into balance. The net is a heating followed by a cooling, not one or the other. In the long term, the total input matches the total output for equilibrium. The actual cases are never in equilibrium, but are lagging and always moving toward equilibrium due to ocean and land storage and currents and wind movement of the energy. “1) Lord Rees (Royal Society) to be asked by UEA to investigate CRU leak. UEA and CRU are beng hung out to dry. Mann has got one foot in the lifeboat. Climate is a non-linear chaotc system so trends mean nothing, as the average temperature of the globe is always going up down as it tracks around each of it’s strange attractors (as can be seen on the graph). However, what is meaningful is that over the 2000 years shown, the difference between max and min temperature, taken to the limits of the error bars, is only 1.3 degrees Celcius. Has anyone noticed the growth in the Artic ice-extent over the past month? Hmmmm … look like many of the links don’t work. Was he expecting no one would look at this? I think RaCook has a good point. Mann’s charts don’t really rule out the MWP. Actually, if you look at most statements by warmist scientists, they pretty much always leave themselves wiggle room. In fact, if you look at the IPCC reports carefully, they never flat out predict catastrophic warming. Anyway, I think what’s going on is that the Team, faced with evidence that undermines their hypothesis, is just trying to muddy the waters a bit to rehabilitate CAGW. Mann’s talk about El Ninos, volcanos, and regional effects are (for his purposes) epicycles. As has been stated many times in these blogs, science moves on from further study and peer review, even if the review is conciously trying to be blocked. For the historical perspecitve II highly recommend the Brian Fagan books available on http://www.amazon.com/ , all for <$10 used including shipping. Interesting, in that in the introduction Fagan states he completely agrees with the IPCC, then after writing that, he writes hundreds of pages with thousands of references, all proving that there have been dramatic swings in climate for the past 1,000 years, not just since man began creating significant CO2 in about 1940. He ignores his own voluminous EVIDENCE. Highly recommended, skip the foreward, or take it in context of ClimateGate. It still uses the “S1” reconstruction. No one has the code and data for that, do they? Meanwhile, back in the real world where actual measurements exist, we are getting more of that “projected US Southwest drought” tonight and this weekend. About 4 to 7 inches of white “drought” plus rain (oops, can’t say that word, can we?) are forecast to fall across Kern County (Bakersfield and surrounding areas) in Southern California. Seems a cold weather front is pushing through. Hmmm…and northern California, Oregon, and Washington just got pounded with rain and snow. Why is he pushing out a new report and can’t even release numbers from any of his past reports? New reports from him won’t salvage his previous vindictive actions and defective claims. (1) Provides a link to a file of all raw data before any manilulation. This includes all valid raw data that was not included and why. (2) States each mathematical operation used to ‘adjust’ data, the amount of adjustment, and basis for the amount of adjustment. (3) Explains which statistical operations are used to analyse the adjusted data. Most of what he does will probably be citing a compendium of end results from other researchers that use his past ‘peer reviewed’ data selection, data adjustment, and data analysis methods, the peers all being from their clique. Those papers will not have provided (1), (2), and/or (3) listed above. There will be no transparancy in this. He hasn’t had time to change his way and means. Just an informal wager, you know. If the data set are corrected then corrected then corrected can the real data please stand up? There will be an agreement at Copenwarmin. It is no coincidence that the Indian Prime Minister was the “guest of honour” at the gala gala doo doo at the White House the other day. Manmohan Singh (Manny the Mo to his friends) will have been promised the moon by Dear Leader to get him to sign on for the ride. We wont know just what he has been promised until BHO throws him under the bus a few months later. Also no coincidence that the Chinese have been making noises about reducing their carbon levels by so and so amount at some vague date many years from now. The email scandal has made an agreement at Copenhagen a certainty IMHO. And by all means, please point out to me that I was terribly mistaken should I prove to be wrong on this! I could hope for nothing better. …will be proven scientist anomolies. I agree with geronimo. I believe these guys were working in relative isolation and anonymity but then found themselves in the middle of something that grew furiously beyond their influence without anyway to dissociate themselves. I believe that their coping mechanism was to delude themselves into “believing” their rubbish and presenting themselves as the experts. Well, Anthony you’ve got it today and already today German Spiegel Online publishes an interview about it with Mann and Shindell. Now one argues a bit if “global warming” is really the right term or if regional effects have to be researched in more detail in the future … (based on real science hopefully). Even if it looks as natural variations have more influence, this is not the case, warns Shindell. And I have learned that during MWP the temperatures across wide areas in the Pacific have been pretty cool (well, no airports close to swimming stations). Doesn’t Google own You Tube now? Doesn’t Al Gore sit on the Board, there? Under the banner ‘Past Climate anomalies explained’ the BBC Sci-tech section of the news has been quick to pump out the latest ‘On message’ explanation of the MIA and MWP. Also a leading BBC weather journo has been found to have been sitting on the infamous hacked E-mails for six weeks and said nothing. The BBC is a publicly funded organisation. Under threat of fine or imprisonment I have to pay for a tv licence. I dont think even the communist Russians HAD to buy Pravda like I HAVE to pay for the BBC propaganda which I get. Have you seen that Zorita wants to bann Mann et al? The “hide the decline” in Phil Jones’ Nov. 16, 1999, e-mail referred to Mann’s 1998 temperature chart that hid the declining reliability of tree-rings after 1960. Mann’s chart apparently shows temperatures from 1900 to 1960, as reflected in tree ring studies, and then tacks on actual thermometer readings for the years 1961 to 1998. Both Mann and McIntyre said this yesterday. According to skeptic McIntyre, the “hiding” was not exactly an exercise in deception, but McIntyre also said Mann has not yet fully explained why tree rings were a good measure until 1960, but a bad measure after 1960. Kate @ 02:14:42 – it is not from The Onion, I hope? On a related note (and by way of threadjack – my apologies), has anyone seen this: http://arxiv.org/PS_cache/arxiv/pdf/0707/0707.1161v4.pdf ? I admit, my understanding of physics involved is marginal at best, but can anyone comment on whether it makes sense? I’ve been wondering a bit about who the 2500 consensus scientists are. If we have names, then we can check with each to see what they actually believe. So if they have 2500 people who agree with them, where’s that list? I think it is the people who signed the IPCC AR4, the ones who got the nobel prize. with 9 pages and about 50 authors per page that makes about 450 names in working groupII. It is interesting that the author list is not immediately available . Maybe we should ask the obel prize committee for the full list. It appears that google is censoring their autosuggest function. Yesterday it would autosuggest “climategate” but it no longer appears in the list! Been there done that and failed — thank you McIntyre. Same games still going on. I hope the hacker/leaker as more documents to dump after Copenhagen otherwise ClimateGate is about to go into history as the Copenhagen PR Buldozer starts rolling and new reports like this one are repeated ad-nausium to confuse facts in the Joe Public’s mind. I have noticed as well that a Google search of “Climate email” produces a first page of warmist sites/blogs, the first of wich being Moonbat’s. Has Google been taken over by Wikipidia? Misleading? Like Mann’s fraudulent hockey stick hokum? We prefer to refer to Mann as a Junk-Science Anomaly (except, of course in AGW “science” it appears to be the norm) to underscore that, while real science is still done by ethical professionals who adhere to the rules of the method, there are highly variable instances of garbage and outright fraud can be found from discipline to discipline. I’m wondering about the timing of this paper. It appears that it was originally to be released to help bolster Copenhagen and most likely was in the pipeline before the scandal broke. If it was published anyway it either shows complete arrogance or this it possible that Science wants to embarrass Mann for his part in this cr*p.
Most internet users have grown accustomed to rigid, deterministic behavior from the sites, the forums, the commerce sites they frequent, I can say that youtube is a couple standard deviations outside this norm. I will say, they seem to place a priority on serving up the vids they have, but all other services on the site are secondary services at best. Of course, YM (and opinion) MV. ‘Medieval Climate Anomaly’ — in other words: “an anomalous one off event, that had some hot and cold, so nothing to see here … move along”. Again, Plan A’s hockey sticks blew up so onto Plan B muddy everything — Mann’s Mudd. I’m a little surprised to see the ENSO itself turned into a hockey stick – La Nina conditions from 500 AD to 1870 AD or so. (the variable ENSO is reconstructed with an average of -0.5C in the past – I don’t think it is worth going into the data and methods). I have also found google to be a very biased site like Wiki. Me thinks Google should do some Googling. I’m glad Mr. Mann has come round to the consensus view, will he now become a realist? One day on the road to Damascus…….. . The financial impacts of the ClimateGate scandal will be discussed in a special segment tomorrow (Sat. 11/28 ) on Fox Business Block (The Cost of Freedom ) on Fox News beginning at 10am ET. Should be interesting to hear what they say the potential market fallout from all this might be, although it seems fairly obvious. If it hurts the money guys, you can bet they will be the first to grab a shovel and bury AGW. As has been said in another context: “Follow the money”. @ Jason – Tim and Judi did an excellent article that you referenced. We already knew about the MWP and the LIA… so why the fuss over a “formerly reputable?” scientist named Mann – infamous for Mann made global warming – why give the guy any press – he is a fraud and should be in jail why we sort this out. This is going to shake the trust of the world – unless we clean house now! What if all congressmen take a real Hockey Stick with them to your congress when discussing C&T? A surprisingly open-minded, even eirenic column by Andy Revkin today, featuring Judy Curry, who posted in the past few days, on Climate Audit. Sorry, but this is garbage…claiming ENSO was always La Nina until very recently defies the Gods of history. The Incas beg to differ…they seemeed to be well acquainted with the 3-7 year ENSO cycle I learned about in school. In this PR two-step we are seeing quite a bit of the “After Breakdown UEACRU Swoon Effect” science (ABUSE SCIENCE) with Mann spinning away from the heat somewhat. By admitting a slight” MWP and gently cooling LIA he is beginning the dance to adjust as seamlessly as possible toward a more tenable position. He’s scared sick of the wave of FOI requests that must surely be about to swamp all these fortified institutions. He has all his friends in the et al to save their arses, too. No, it is not on the list. Even after you put in the full “climategate”, it has “Climate Guatemala” and “Climate Guatemala City” under it. No thermageddon??? I may not have understood the BBC article, but is someone looking for an escape route. Is it Mann or the BBC????? Corey wrote: No, it is not on the list. Even after you put in the full “climategate”, it has “Climate Guatemala” and “Climate Guatemala City” under it. Thanks! Now we need to find a way to prove that it was there yesterday. I’m doing some research on that right now. I sent the story to Newsbusters.org and Noel Sheppard already responded. Coming back later and saying “we have not seen eye to eye” while at the same time engaging in post bombing time insults my intelligence and the intelligence of readers here when what was called for was an apology. Endless publicly funded climate research by meteorologists such as M Mann is definitely not the way to go. The work will go on for decades and decades producing guff. As the specific target of the warmists is a massive reduction in CO2 emissions the research should be directed at the physics of CO2 long wave radiation absorption. The absorption bands for CO2 are non existent between 7 and 13 microns allowing 70 to 90% of the radiation from earth to escape to space. This would be true even for a doubling of CO2 from 350 to 700ppm.This micron range is called ‘open window radiation’ where the greatest portion of radiation emitted by the earth is found. It could be clearly established that it is impossible for CO2 to cause global warming and the warmists view that the spectral band 12 to 18 microns includes the peak emission of the Earth’s spectrum thoroughly discredited. Wien’s law shows that a wavelength of maximal emission λmax of 15μm yields a temperature of minus 80C; whilst 15C gives a maximal emission λmax of 10μm. P Gosselin (00:46:35) : BBC debate. Mann’s publication and further discussion of the science of climate is moot in the face of malfeasance. The debate at this point cannot go back in time before we knew of East Anglia. We know. We know more every day. And the more we know the more we see that Jones, Mann, and CRU cronies worked actively to kill even-handed research and debate. Now, we must address the issue of the climate elite manipulating, deleting and hiding data that SHOULD have been included in debate. The science cannot resume until we have addressed the issues of malfeasance. The only agreement at Copenhagen if the junketeers insist on convening – is to throw open wide the doors of investigation. Establish an fully independent international investigatory committee to look NOT at the means of the leak – but the CONTENT of the leak. Any discussion of caps and emissions now is hogwash. The people of Earth want to know why their “experts” and “media” and “governments” have been complicit in the greatest fraud perpetrated on mankind since Eden’s snake whispered to Eve. It is epic. And CB DeMille is itching for a comeback. “Meanwhile, back in the real world where actual measurements exist, we are getting more of that “projected US Southwest drought” tonight and this weekend. About 4 to 7 inches of white “drought” plus rain (oops, can’t say that word, can we?) are forecast to fall across Kern County (Bakersfield and surrounding areas) in Southern California. Seems a cold weather front is pushing through. I think most climate scientists get so used to dealing with global averages that they forget that what we experience of climate is local and it is here we fnd the extremes. The rich tapestry of turbulence and boundary condition effects are what real climate is about. These events are the nuts and bolts of the excess energy removal systems whch regulates the Earth so well, as is demonstrated in Mann’s graph. So there are no long-term trends or any chance of accurate future forecasts beyond a few days, just chotic climate happening on a second by second basis. Regarding CRU et al, perhaps a kinder term than ‘liars’ would be bender – appropriate, perhaps, because of their propensity to manufacture hockey sticks. How can anyone know with any reliability what was weather/climate in Pacific in medieval period? We certainly know if it was glacial or not but besides that what is the error margin? This is really not so out of topic, and hilarious. Another possible aspect/set up from Mann’s latest paper… in some of the leaked emails a bunch of them were discussing problems with being able to forecast regional variations and I believe mentioned getting pressure from politico’s for better regional casts. Seems that this latest paper, in hitting on a supposed regional only MWP, works to set up the prospects for greater research and funding into regional forecasting. Perhaps just another way to pave a path forward for ‘the team’ to continue to get large grants. Gee, now that the science is settled in terms of global warming (even if we have a little bit of tweaking here and there, well, that’s just to be expected), now its time to turn to the fine tuning so we can help ALL of you with what each of your regions can expect for the future! @Dave (08:25:11) :-SNIP- Also a leading BBC weather journo has been found to have been sitting on the infamous hacked E-mails for six weeks and said nothing. Doesn’t that mean that they are also subject to FOI requests? If so, might be quite interesting if a request is made for ALL BBC correspondence, emails, memo’s, documents related to the hacked/leaked CRU information from the minute it was received up until the day it went public. I’m assuming that FOI’s can only come from citizens, not from those of us in other nations? Is that correct? Reference: Debate!! Yes, on the BBC! At 7:30 in the BBC interview, Dr. Watson is asked why the data haven’t been released. Essentially, he answers that the data are owned by the various National Meteorlogical Services, and therefore, it is not proper for the UEA CRU to release the data. (1) Has UEA CRU released any meteorological data not owned by UEA CRU to any organization(s)? (2) Which organizations and which data? (3) Did UEA CRU have permission to release such data? (4) If yes (to 3), could we see documentaion of such permission? (5) If no (to 3), can you explain the criteria by which the UEA CRU makes the decision to illegally (at least according to Dr. Watson) release the data to a requesting organization? Somehow I believe a cross-examination by a competent lawyer would soon have Dr. Watson wishing he had never participated in the interview. The Polynesians were colonizing the Pacific 1000 years before they arrived in New Zealand in 1300. They traveled in large ocean-going canoes (waka), which were somewhat storm sensitive. Now there was obviously a lot of trans-island travel in the jumping off point, and they must have been fine seamen to make colonizing ships. They also must have had an idea where they were going. It seems obvious that the Pacific was not very stormy in this period. She does not get it. The AGW people seem to think that there are no scientists that are skeptics and to question AGW makes one some sort of low life. I don’t think she understands the scientific method has been corrupted. How about “Hiders”? That should get them hopping mad. Greenland at that time had trees growing wild in at least a few places. Woods. Forests. None since. The political battle was lost long ago. So let’s get back to the scientific process and get these perverts of science prosecuted and discredited. The trouble is that such anecdotal evidence (Roman wine grape cultivation in Britain is another one that is frequently trotted out) is worth very little. It reveals more about economics and standards of living than climate. It is more likely the farms were abandoned because sheep grazing became more profitable than growing crops on marginal land (as in the Highland Clearances of Scotland), that suboptimal farming became uneconomic because of agricultural imports brought about by improved communications or that rising standards of living made a poor life scratching a living on highland farms an unattractive option. Similarly the Roman vineyards in Britain don’t say much about past climate: hobbyists and small commercial winemakers show it’s perfectly possible to produce wine in England today. But now we can easily and cheaply import wine from the other side of the world in a way the Romans could not. That is why this sort of anecdotal evidence is almost useless and we need hard physical evidence. Regarding the hockey stick, here’s Monckton’s long paper describing the shenanigans behind protecting it from criticism and “verifying” it, followed (pages 16-29) by summaries of 21 published papers that provide evidence of warming during the MWP. (Ten papers deal with Europe and the North Atlantic, eleven scientific papers address the period elsewhere on the planet.) Each summary occupies about half a page and contains a graph that illustrates key data points. The frozen Viking bodies beneath Greenland’s permafrost are hard evidence. As for anecdotal evidence, that’s what we’ve got, in effect, from the CRUsaders–stories. PS–by “stories,” I mean stuff that’s been made up. Any swedes reading this, do you still have a free press in Sweden that could account for this?? Aunty Beeb used to be a proud old lady but now she is a tired old whore with her pants down taking it from global government. No-one’s mentioned this yet. (I think). Mann is still using the Tiljander sediment series inverted according to Jean S over at CA. This is a fantastic piece of work, Rudolf, well worth publishing the Medieval Warm Period material here as a counterweight to this latest uu@W. One request: it would be nice to have the map able to fit my 1024 x 768 pixels screen! And looking at the ‘y’ axis, all accurate to within 0.1 deg C — quite the proxies! The antonym for sceptic is gullible, not liar. In any case, I suspect bender would not approve of the term bender as a synonym for liar. Is the Tiljander series the same as David Kaufmann’s Korttajarvi series, or is this another instance of flipped data in a “Team” paper? (Nick’s graph) and post it to RealClimate. Do you all agree? “Flora and fauna are determined by the Arctic climate. The vegetation is characterised by an absence of trees. However, in sheltered valleys in South Greenland there is rock birch, mountain ash, alder and willow scrub. Grain cannot ripen in Greenland. The overall vegetation is low rock and tundra plants: mosses, lichen, heather, crowberry etc. In North Greenland most rocks are bare or with a low vegetation. During the Viking settlement, structural timber came from North America since none was available locally. The Greenlanders exported mainly walrus tusks (used as an ivory substitute) and polar bear skins. Imports from Europe amounted to ~4.5 kg/person/year, mainly iron as there were no known deposits of bog-iron in either Greenland, or at the N. American settlement at that time. @ Ed (13:02:11) : “The trouble is that such anecdotal evidence (Roman wine grape cultivation in Britain is another one that is frequently trotted out) is worth very little. It reveals more about economics and standards of living than climate. England currently produces wine from grapes one year out of ten according to the winegrowers association. Nine years out of ten, they need to either add sucrose (cane sugar), or use vacuum distillation to remove some of the water. Sucrose was insanely expensive during the MWP and didn’t become affordable until the settlement of America several hundred years later. Perhaps you have some evidence that they had access to vacuum distillation equipment from the 19thC. To get an idea of how expensive sucrose was, one of the Henry kings managed to muster almost 1.5kg (3lb) of sucrose for a banquet. The accumulation of this huge (for the time) amount took several months. Lucy Skywalker, thanks for the lovely graphic, never seen it before. Thanks for correction. So there are a few trees growing naturally in sheltered valleys in South Greenland today – plus the arboretum I heard about but discounted for the post as it’s “artificial” tending and pretty recent. However, I doubt the paragraph which says that the Vikings had to import structural timbers and seems to suggest there were no forests in the Greenland MWP. My info source suggested clearly that trees grew in some sheltered areas of Greenland at that time, where no trees exist today. Quaternary Glaciations – Extent and Chronology, Part III. Elsevier, pp. 3-43. So why does M. Mann wait so long to recognize the obvious? I have not been able to find any reference to this one year out of ten, only that sucrose is added to increase the alcohol content and quality of the wine. I think it is fairly safe to assume that what would have been considered acceptable in Roman Britain could fall well below modern commercial standards. It is a mistake to assume that simply because modern tastes would demand the addition of sugar that people living on the far edge of the Roman Empire would have had the same requirements. One might as well argue that Roman Britain must have been warmer than today because they didn’t have gas central heating and they would have been too cold otherwise. I made a comment above about the hockey stick shape of the ENSO (Nino 3) in Mann’s paper. I’ve thought about that some more and, one could end up with that scenario if one was building in a cooler overall ocean starting about 150 years ago. The ocean surface has warmed by about 0.4C to 0.5C so one could make the assumption that both the Nino 3 and North Atlantic were, on average, about 0.5C cooler going back in time. Its just that I have seen other ENSO reconstructions which do not have this -0.5C built in. The equatorial Pacific has not warmed like the rest of the oceans – there was an upward trend until about 1944 and then the average has been stable since then. So, Mann can use a lower Nino 3 average in the past if he wants to but he should be citing the other reconstructions and noting why his is different. A Monte Carlo inverse method has been used on the temperature profiles measured down through the Greenland Ice Core Project (GRIP) borehole, at the summit of the Greenland Ice Sheet……………. The Last Glacial Maximum, the Climatic Optimum, the Medieval Warmth, the Little Ice Age, and a warm period at 1930 A.D. are resolved from the GRIP reconstruction with the amplitudes -23 kelvin, +2.5 kelvin, +1 kelvin, -1 kelvin, and +0.5 kelvin, respectively. Climatic Optimum +2.5, the Medieval Warmth +1, the Little Ice Age -1, and a warm period at 1930 A.D +0.5. Anyone can download the Greenland ice core d018 isotope data here. And I can confirm that the figures you quoted for the Greenland temperature history are about right (although there is still variability within the averages). Molon Labe: Sorry about the delay in replying, but Mann et al (2009) leaves me with more questions than answers. But then they smoothed it with a decadal filter for their Figure 1 and spliced it to the HADSST2 anomaly data for the NINO3 region. And of course they failed to note how unreliable eastern equatorial Pacific SST data are before the opening of the Panama Canal in 1914 and without noting the decadal gap in the HADSST2 data for that area from the 1860s to the 1870s. Would that gap in the data bias the NINO3 SST anomalies down during the early decades of the HADSST2 data when smoothed with a decadal filter? It might. Were there El Nino events during that period? Dunno, based on the data. Were there La Nina events? Dunno. Did the frequency and magnitude of El Nino events exceed those of La Nina events, or were La Nina events dominant? No one knows, based on that dataset. Why did they stop their reconstructed SST data in 1850 and splice the observational reconstruction data onto the end? Why isn’t there an overlap? The proxy SST data doesn’t simply stop in 1850. The corrected section of this paper shows a corrected global temperature reconstruction based on non-tree proxies . [ See Fig2. ]If this graph is more representative of the real past climate , then non of the proxy graphs being debated here come anywhere close to this shape .Clearly MWP was much warmer than now. Hi mate, the BBC man in question is called Paul Hudson and the story of him has now been outed by a leading tabloid (The Daily Mail). Sorry I can’t add to the science like most of you good folk on here but I may be able to give a perspective as to how this story is being suppressed in the UK. I’m no expert, but am pretty certain that there’s a huge difference between merely having forest, versus actual structural timber. You can have forests that are of either soft, or crooked, or simply not large enough diameter trees very easily – all of which would be unusable for structural timbers. Then there are various reports of MWP treelines being notably further north, and/or higher, in a number of places relative to current day treelines. I believe Canada is one of those areas. The recent indo-pacific warm pool study of sediments, and so on. It seems that at the very least we can say the science is not settled, and the WPM could very well have been at least as warm and quite possibly warmer than present day. Significant flaws would have to be found in each of these studies if one were to try to dispute their temperature comparisons/reconstructions. Which of course says that today could very well be nothing more than natural variation. Which pretty much blows the whole AGW theory right there, in addition to all of the other holes that have been shot thru it over the years, but that have also gone ignored by the AGW machine. I mean, when you have alternative explanations to your theory, that have even a reasonable possibility of being as correct as your theory, then your theory is kaput, at least in that form/evolution because it doesn’t describe or explain the system or data you are studying any more conclusively than other theories. Warmth over the Arctic and northern Europe leads to more La NIñas because of excess melting in the Arctic that drives water downward up there and pushes it up in the equatorial Pacific. At the same time, if the Arctic is unusually cold and less melting occurs, less upwelling occurs in the Niño zones, inducing El Niño. Previous studies support this notion not only due to sediment cores in the tropical Pacific, but also historical events like the downfalls of the Mayans and desert southwest civilizations due to prolonged drought (no doubt tied to persistent La Niña conditions that favor drought in those regions). Other studies have found that the earth was more or less in a constant state of El Niño during the ice age, suggesting that less Arctic melting and weaker trade winds pushed warmer water eastward in the Pacific. El Niño and La Niña are a negative feedback loop ultimately caused by weather patterns in the Arctic and north Atlantic. Even so, some El Niño and La Niña events are purely atmosphere driven and ahve little to do with Arctic melting. These Niño events also tend to ahve the smallest impact on global temps. (Look at large tropical volcanic eruptions and the strong El Niños that tend to form shortly afterward… and yet the planet cools). I believe a colder planet ultimately results in a persistent state of weak El Niño while a hot planet results in a persistent state of strong La Niña. I also have theorized that the intensity (though not the cycles themselves) of the PDO is correlated to solar activity. PDO intensity seems to be weaker when the sun is weaker and vice versa. The negative PDO phase of 1945-1975 and the positive PDO of 1977-1998 were very intense cycles that coincided with the strongest sun in centuries. Again: La Niña is a sign that there is a lot of melting going on but ultimately cools the planet since the massive pool of colder water at teh equator stores energy from the sun… while El Niño is a product of less melting but ultimately warms the atmosphere by releasing some of that stored energy and water vapor into the atmosphere. Now of course some El Niños and La Niñas are simply reactions to preceding episodes since the ENSO is rarely in balance (like this El Niño likely being a reaction to the strong La Niña in 07/08 and its weak sister last winter).